The Adventure Begins	Adios Georgia! 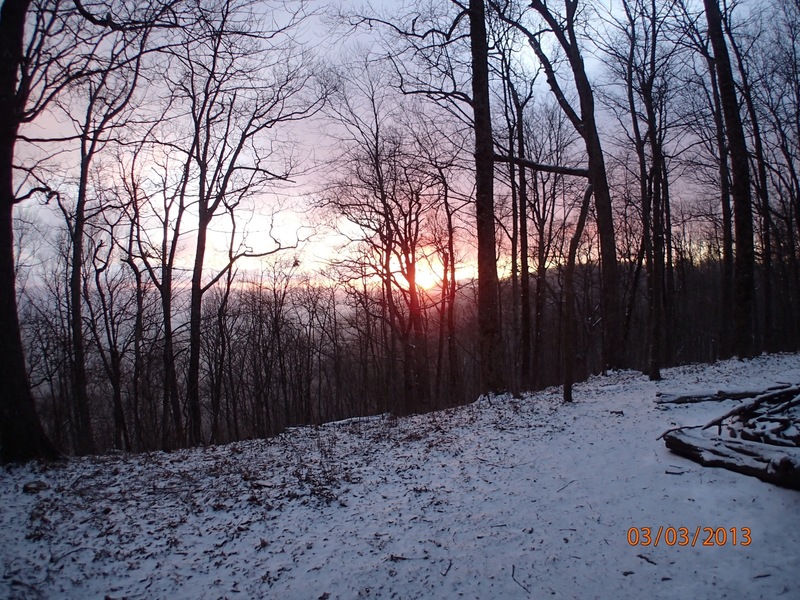 Quick Blog: have my longest hike 15.5 miles, see more snow, catch up with friends, meet new friends and stayed at the blueberry patch hostel. Hang in town taking a zero day, get stuck in town by a snow storm. Read on for details! 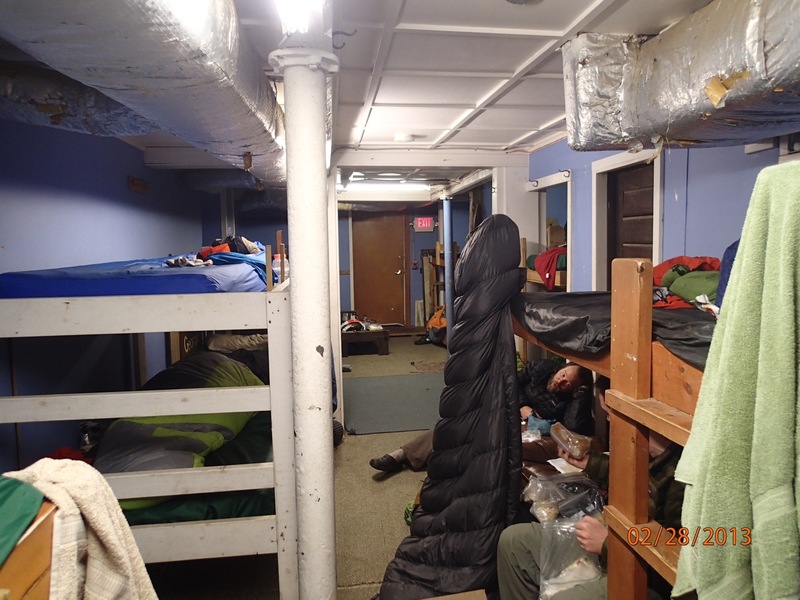 Hanging at the hostel has been fun, Pirate, a thru hiker that manages the hostel, cooked chili for dinner…he doesn’t charge for dinner but takes donations, if he gets enough then we get breakfast too! Agent D decided to stay so we will get to see more of him on the trail. Samson, Foodwalker, Tracey McGee, Heart Rock and Buzzsaw all made it in but Tracey is running a fever so they may take a zero day. I have moderated my plan for the next few days to break a planned 15.5 mile hike into 2 days…I think my plan is pretty much out the window from this point on which is fine, I really don’t want to be on a “schedule” out here…the only place I need to be is in Maine in the next 6 months or so…God is great and life is good! Got a decent start after a pancake breakfast and headed up out of Neels Gap, climbing a 1000 feet from the get go. It was a good hike but a cold day averaging about 30 degrees with light snow. I met a few other hikers on the trail, one was a thru hiker the other was a section hiker named Junebug. I made my 11 miles in 6 hours to Low Gap Shelter, which was pretty good time with my knee still hurting on the down hills and flats. I got an ace bandage from Mountain Crossing and wrapped my knee today, I believe it helped a little…I will keep popping vitamin I (trail name for ibuprofen). I will probably pick up a brace when I get to a town with a Walmart ( that will be a big town for this area). Looks like we have some stragglers coming its 7:37 and completely dark. I’m here with Agent D, Lost Boy, Heart Rock and his dad…we are wondering if its Foodwalker and Tracey McGee. We are ready to help them out and cooked them some dinner! It was…we got them up and in the shelter, boiled some water and got them fed! We are now a cozy 7 in the shelter but it feels like the family is all together…funny how you can bond with people in under a week! 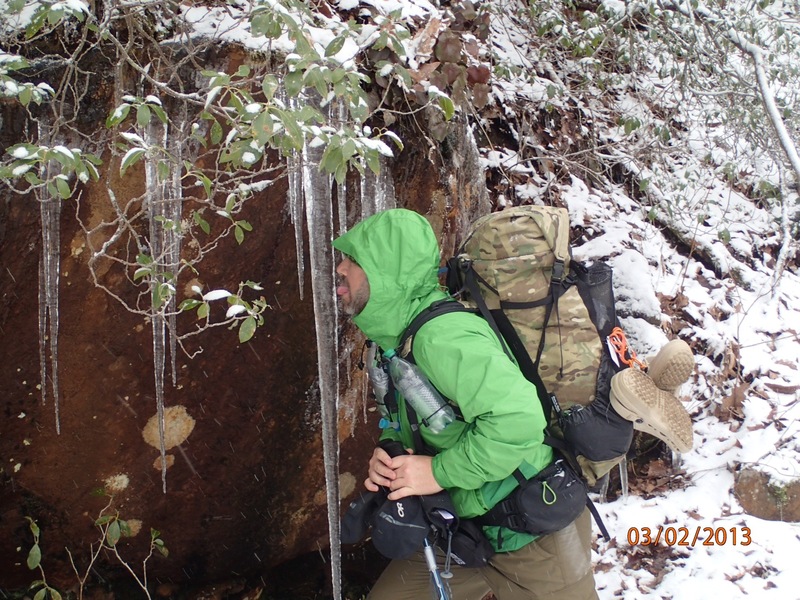 It snowed most of the night and left about 3 to 4 inches on the ground, this made hiking a little difficult. 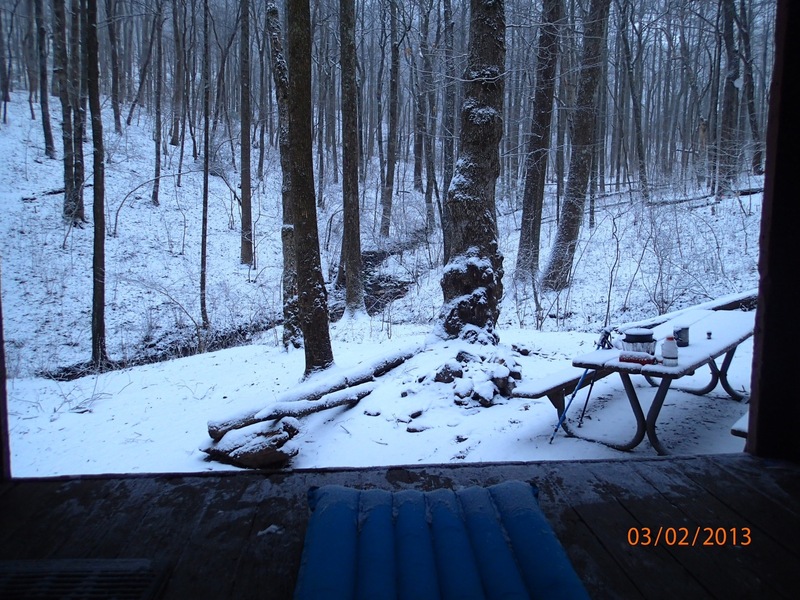 But got a decent start and made it to Blue Mountain Shelter in 4 hours…I thought about pushing on but decided to stay. I hiked most of the day with Lost Boy and got passed in the end by Warbler (both are in their early 20’s). 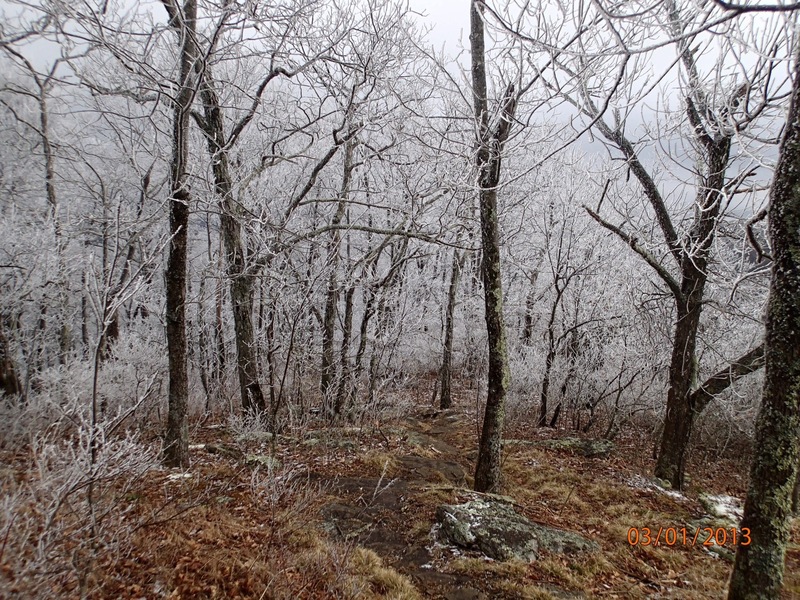 Several of the thru hikers that had stayed at the last shelter decided to drop down to Unicoi Gap and go into town. I seriously considered this my self but want to rough it out to see what I can handle. I must admit I got a little anxious when several hours had gone by and my regular traveling crew had not shown up (Foodwalker, Tracey McGee, Heart Rock and his father). I was afraid they had skipped the shelter and head for town as well…I really didn’t want to be up here by myself! Samson continues to walk until he is tired then he camps, he stopped by for a minute and Agent D went ahead another 6 miles to camp, a little anxious for him as he only uses a tarp which basically means he has a plastic canopy over his head then sleeps on the bare ground…it is supposed to snow again tonight and I worry about him. Tomorrow I am going to push for my longest and toughest day, 15.5 miles, this will set me up for a short hike to the Blueberry Patch Hostel and get me off the mountain for a night as bad weather continues to roll in. My hike from Blue Mountain was really good! The sun was out for most of the day and it was a pretty hike! My knee didn’t give me too much trouble and I made pretty good time, under 9 hours. 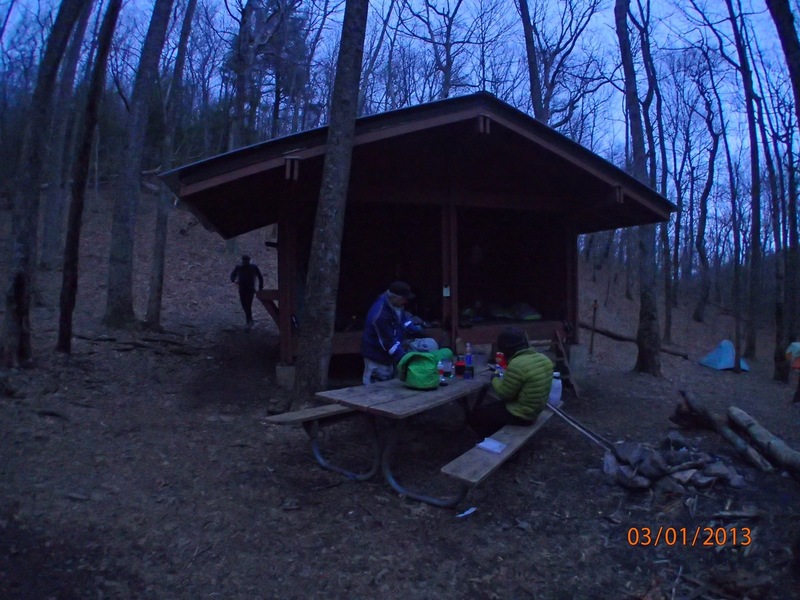 I made it down to Deep Gap Shelter and it was about 20 degrees outside, there were 2 college student section hikers trying to start a fire…I have already learned that this is futile so I cook my dinner and climb into my bag to endure another night in the teens. Got an early start out of Deep Gap and headed the 4 miles to Dicks Creek Gap to get to the Blueberry Patch Hostel. I made the gap in just under 2 hours and got a ride the 3 miles to the Blueberry Patch Hostel and find Agent D still there! He had survived the bitter cold tarp camping but was very cold so ordered a new sleeping bag and was waiting for it to be delivered. Met up with a new hiker named Brad, no trail name yet, and is laid up with a bad hip. Gary Poteat, owner, gave us a ride into town and we walked to a pizza buffet and chowder down! When we got back to the hostel Samson was there napping in a bunk. I had met up with Samson the day before on the trail and told him about the Blueberry Patch. We all sat around, ate cheese, summer sausage and bread talking about our adventures. The next morning the Poteats made a big breakfast of eggs, sausage, pancakes, biscuits and hash browns…we all ate our fill! Samson hit the trail, Agent D waited around for his new bag and Brad and I headed into town to take a zero day (day with no hiking). The rest of the day was spent laying around and running errands in town. Preparing to get back on the trail. Well getting on the trail ended up being a no go as we woke up to a white out snow storm. So here I am stuck in Hiawassee Georgia at the Mulls Motel…wee! The weather is supposed to improve tomorrow so I will hit the trail again…Brad will be back out there as well and will stop in Franklin, NC to get his hip,checked…prayers for Brad if you please! I got a text from Agent D that he and Samson were holed up in a shelter freezing their butts off…I’m glad Agent got that new bag! In reflection, I know that I am off “schedule” (not that I’m really keeping to a schedule)…but now is the time to take my time and try to let some of this winter get ahead of me! Do you have a trail name yet?! Sounds like you are off to a good start, which the weather didn’t help out with for sure. Thanks for sharing your journey! Really enjoying your blogs and photos! Sounds like you got lucky being in a hotel when the winter storm blew in! Stay healthy! We’re all praying for you. Nomad, be on the lookout for an adjective or 2 to complete your trail name. Love it. So exciting! Stay warm and enjoy every moment. Sounds like there is never a dull moment!! Know that I am praying for you every day. Thank you for sharing your journey – You are so blessed to be where you are!! PRAYING DAILY FOR YOU AND ALL YOUR HIKING FAMILY!!! LOVE THE PICTURES…LOVE YOU! !